However, I have also read her autobiography ‘Is it just me?’ and as of this Christmas, have seen the DVD of the live tour. After consuming these products, it is clear that Series 3 repeats much of the material from Miranda’s book which gave me the feeling of wishing I hadn’t read the book before so not to ruin the jokes. It felt like when you read a book before you see a film and you notice how much the screenplay has strayed from the book and mistakes are emphasised (a scenario which happened with Harry Potter 6 for me – that film will always be a disappointment to me). For Series 3 I already knew all the jokes ahead of watching. Luckily, the introduction of Michael as her future boyfriend in the series was enough to cover this. Again, the DVD, which on the flipside I watched after the Christmas episode but before the final episode, was just an extension of the jokes of the series and the book. Whilst there were some laugh out loud moments, the main points of humour just felt like they had been repeated. With the book and the DVD aside, I approached the final two episodes with a fresh mind. I found the Christmas episode clunky, disappointing and almost as if it was not a sitcom at all with Miranda falling into unknown genre territory. I did miss a section in the middle to say goodbye to my Nan before she went home after spending the day with us but I am assured that I only missed the section where Miranda and Stevie went camping and became friends again. I was annoyed by her initial choice to the engagements. I am probably in the minority within the fan community of the show as I have been a big supporter of Miranda and Mike being together. The character Gary completely lost my respect and fondness when he dated Miranda when he had a wife (in series 2) and his commitment phobic attitude/hiding his and Miranda’s relationship in public. He seemed to be a coward to me who couldn’t treat Miranda right. I think I knew how it would end at the beginning of the final episode. It was predictable that Miranda would end up with Gary. 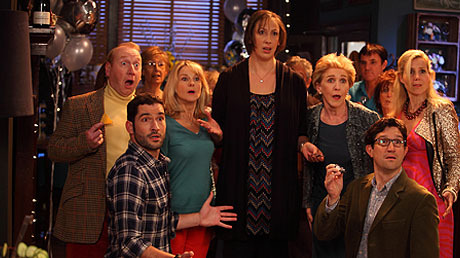 However, the final episode returned to how Miranda should be: funny, great scenes between her and Stevie (especially at the bar) and with fond flashbacks to the past series in true finale style. I know there is criticism about using previous clips but I think clips in a finale are a nice homage to a series and this technique has worked in both the recent sitcom finales of Miranda and Not Going Out (a brilliant finale in my opinion). I also loved the cameos like the “customer” (aka the fab comic actor Dominic Coleman), Mark Heap as the therapist and the return of Clive! I actually squealed with joy when Clive was revealed as the customer’s husband to be at the wedding Miranda and Stevie gatecrashed although I knew the inevitable Miranda/Gary moment was coming up. I loved the episode but found the theme of the episode somewhat misleading. The episode focused on Miranda getting over Gary and standing up to Penny in the process, growing up a bit and the message that was being promoted was that it is ok to be single, you don’t need a man to define you and a little bit of girl power. I thought it was a perfectly crafted message to send out especially when, as I mentioned earlier, the protagonist could be understood as a relatable figure to members of the audience and generally an underrepresented type of person on television. However, it was not to be and Miranda married Gary. On reflection, I suppose there is a slight postfeminist undertone to her relationship as by looking after herself and coping on her own, Miranda feels empowered and makes a confident choice in who she chooses to marry.